Here at Ars Electronica is where we did an unscientific qualitative test of the criteria devised to define New/Interactive Media Art. Now we deliver to you the conclusive results, and do so in the spirit of the David Letterman Top-10 Countdown, only with a Top-15 rather than 10, cause we found 15 things. Forget all the New Media “Theory”; we’ve got your empirically derived criteria right here. There it is. 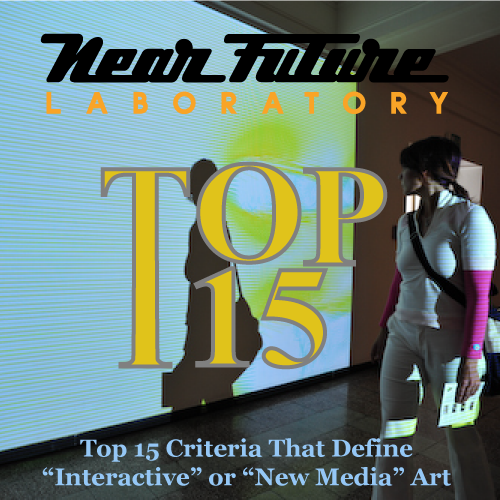 The Near Future Laboratory Top-15+3 Criteria Defining New/Interactive Media Art!